An 18th century Portuguese painted chestnut longcase clock with hand-carved decorations. 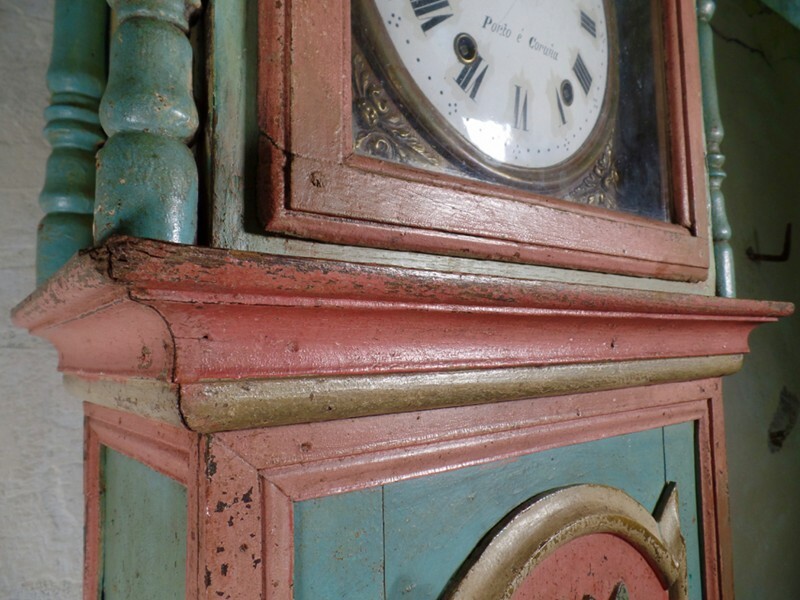 A very striking and original longcase clock, one of a kind piece, simply exceptional. The eight-day birdcage movement striking on a bell, with an arched enameled clockface finished with a brass dial and Roman numerals. The clock face is Inscribed 'Jeremie Girod' 'Porto é Coruna'. The arch is repoussé decorated with exotic birds while the cherrywood case is detailed with a carved urn of flowers and leaves above a mask with glass eyes and mouth. The case still featuring is original probably later, painted decoration of vivid pastel-like colors. A simple and decorative design very in keeping with 18th-century Portuguese furniture. In good condition with a few marks to the frame, the case still has its original key, weights and winding clock key.